Matt Schaefer drew everything with Quill and the Oculus Rift. Hand-painted VR animation isn't new. Oculus developed Quill, a 3D painting package for the Rift, back in 2015 for its now defunct Story Studio. It was released to the public in December 2016 and updated with a slew of filmmaking features three months ago. Since then, a small community has blossomed with VR artist Goro Fujita -- the man behind the incredible A Moment in Time -- at the helm. There are many impressive shorts online, but my favorite is Alex's Sci-Fi World by Matt Schaefer. It's a neon-soaked delight that you should absolutely watch on YouTube or using a Rift and the original Quill file. 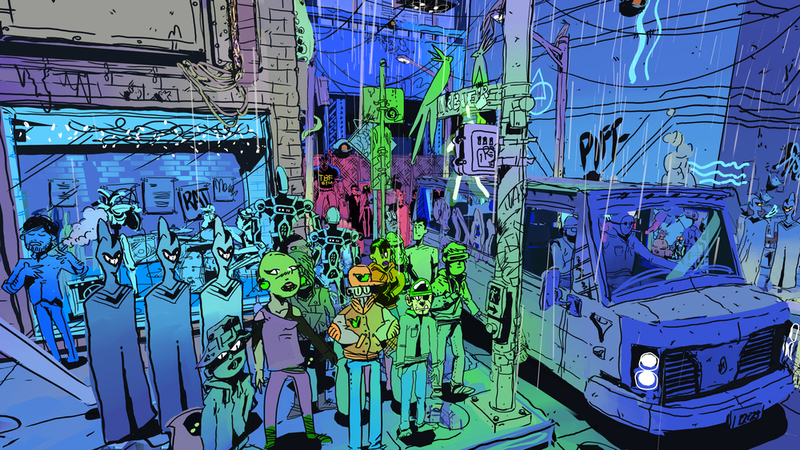 The animation revolves around a small but densely packed street in a multiplanetary future. An imaginative grab bag of aliens line the sidewalk while surveillance robots hover ahead. Neon lights flicker, and a handful of giant tentacles can be seen writhing out of a nearby alleyway. The loop is relatively short, but the level of detail is staggering. Like Special Delivery, a 360-degree film by Google's Spotlight Stories, it's almost impossible to see everything in one sitting. It was only on my second time through, for instance, that I noticed the band and fairy lights inside the main building. The colorful world was inspired by Schaefer's close friend Alex Steven Martin. The pair met at college and played music together for many years. "He was outside the dorm playing Marcus Miller tunes on his bass guitar, and I immediately thought, 'We need to start a band right now,'" Shaefer said. These days, Schaefer is an interaction designer while Martin works as an illustrator and graphic artist in Astoria, New York. In late 2016, Martin posted some illustrations of a graffiti-covered, robot- and monster-occupied city on his blog. They snowballed into a weekly series that Martin uploads to Tumblr and Instagram with the hashtag #scififriday. 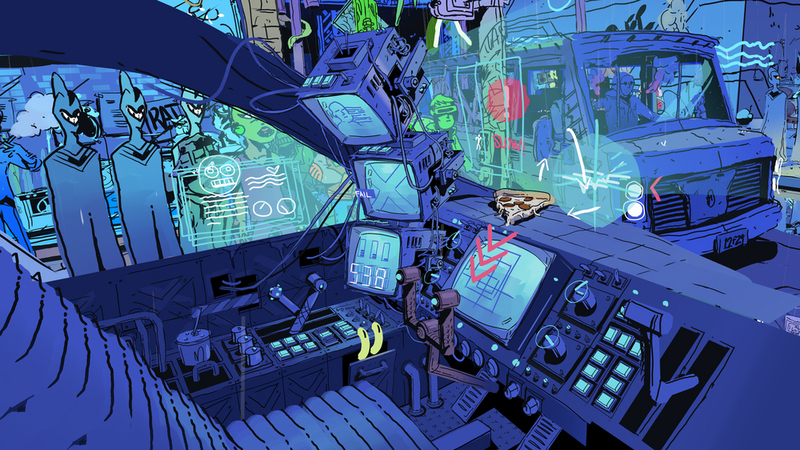 "I would describe them as Blade Runner meets Where's Waldo," Shaefer said, "with some Moebius and Syd Mead mixed in. One day it just clicked and I thought, 'I need to bring his universe to life in VR.'" First, Schaefer redrew a picture that Martin had painted of a futuristic crosswalk. It had a blue-windowed music venue called the Corner, a beaten-up camper van and an eclectic group waiting at a holographic stop sign. "I then mined Alex's body of work for additional elements to complete the out-of-frame areas," Shaefer explained. Then he integrated his own designs, which included monsters, hoverbikes and a Blade Runner-inspired car interior. While Schaefer painted, Martin worked on new, inspirational artwork and music that could be layered on top of the piece. It took four months to finish the painting -- for Schaefer, Alex's Sci-Fi World was an evening and weekend project -- and 10 to 12 hours of animation work. Movement was created through micro-stories, or loops, that overlap with one another. One loop, for instance, is a clumsy robot crashing into a telephone pole. Another is the resulting shockwave that zaps some unsuspecting birds nearby. "The electricity also flows to adjacent power lines, leading the viewer to other micro-stories in the scene," Schaefer explained. "One day it just clicked and I thought, 'I need to bring his universe to life in VR.'" The result is extraordinary. Schaefer prefers Quill to traditional CG animation tools such as Maya and Adobe After Effects because it gives his shorts a rougher, handcrafted feel. "In VR, you're painting and animating spatially," he said. "You also have physical inputs such as motion controllers and head tracking. This makes the creative process, and the end result, feel natural." If you like Schaefer's work, I recommend checking out his website and YouTube channel; the latter has a bunch of interesting VR shorts, including a Sonic and Mario-themed baby-announcement video.